Juanita Rasmus is a pastor, Spiritual Director, and contemplative with a passion for outreach to our world’s most impoverished citizens. Pastor Juanita co-pastors the St. John’s United Methodist Church located in Downtown Houston with her husband Rudy. In 2009, Juanita was diagnosed with kidney cancer, but she wasn’t afraid. Instead she waited to see what lesson the disease would bring. 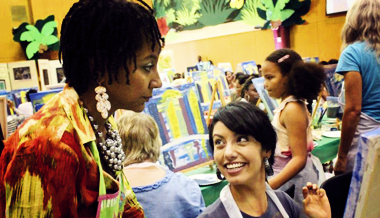 In August 2010, The Art Project Houston (TAPH) was launched, emerging from Juanita’s recovery from cancer. TAPH is a therapeutic art program for the homeless, hungry, and transitioning community of Houston and those concerned about their plight. During her battle to recovery, Juanita rediscovered her identity as an artist and wanted to share with others how art became such a vital part of her healing journey. Her hopes and desire for the project is to help people express their creativity and thus empowering them through artistic endeavors.